Down a quiet Los Angeles street, just east of Hollywood, Miranda July is perfectly poised behind her desk pointing out sketches on her mood board that were the beginnings of her Venice Biennale sculptures. The insanely prolific, award-winning and super inspiring film director, artist and writer is enjoying a rare moment of calm. In between multiple art projects, novels and her follow up feature to Me And You And Everyone We Know, she takes time out with Dazed Digital for an afternoon chat. Dazed Digital: I think the last interview I read from you was just before the Venice Biennale. How was the debut of your Eleven Heavy Things sculptures? Miranda July: I built it up so much, but of course when you get there it’s a huge show and you are a tiny little piece and you are just happy to have done your work and not totally humiliate yourself. For me, it was most satisfying having the idea and making the work in a totally different media. It was a real honour. There were 11 sculptures in the enclosed garden and they were built so they could be posed with. The idea being that if you are posing with them you’re going to want to take a picture, and if you are going to take a picture, you are going to want to share it, and that was a way to disseminate a work that normally wouldn’t be seen by that many people. DD: What inspired those shapes? DD: With regards to your fine art, I love the quotes you did for the Yokohama Triennale. Miranda July: It’s a real reminder to do the random odd thing that doesn’t seem like it’s part of the larger plan. I’ve been focused on the new movie and my novel for a really long time but my friends have a project called The Thing. It’s like a magazine subscription but what you get in the mail are pieces of art. I did the first issue and made two window shades that when you pulled down said, ‘If this shade is down I’m not who you think I am.’ The other said, ‘If this shade is down I’m on my knees begging for forgiveness with tears streaming down my face.’ That was the first time I did that and when I needed to do my Japan show, I went back to that and the text. DD: What made you move from college in California to Portland? 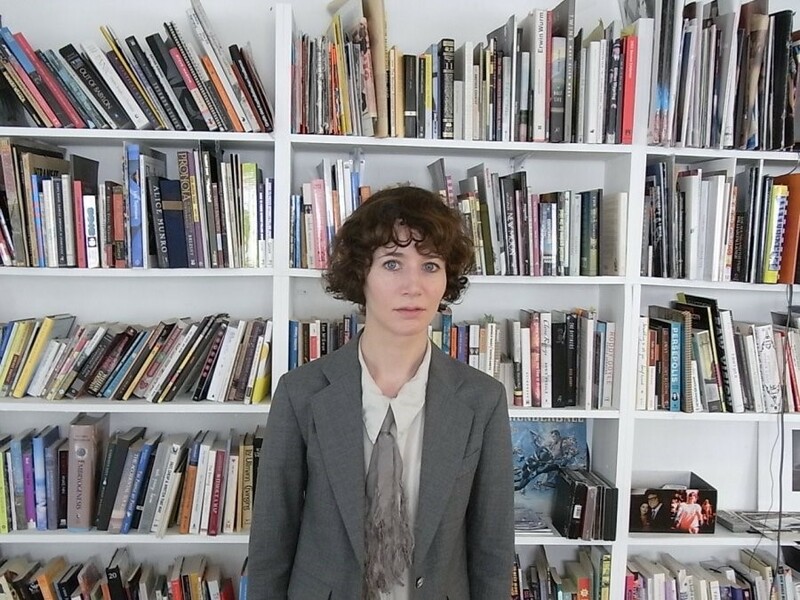 Miranda July: In those early days in (1993/94) I didn’t really study anything. I didn’t declare a major, I didn’t study art. My best friend in high school had moved to Portland and it was incredibly alluring, it was riot grrrl and a lot to do with music, which was funny because I didn’t really play but I made use of all the energy there. It was great for collaborations even if I couldn’t sing. DD: And that was the start of Joanie 4 Jackie? Miranda July: That might have been a little earlier. I wanted to create some sort of feeling that girls were making movies because I was too nervous to. It was a simple idea, any woman who sent me a short movie, I would send her back a tape with her movie and nine others. I did that for many, many years and I would tour, often doing something interactive, like making a movie with the audience. It would feel really special that you were a part of that night. There was almost an aesthetic of revolution that was empowering, and it still is. Especially if you’re really poor and keep getting fired from jobs and you’re basically a kleptomaniac... umm, not anymore. DD: What’s been an inspiration to you recently? Miranda July: I’ve come to realise that I’m very impressionable so it takes the least, littlest bit of something to really carry me. For my first feature, I had something like a couple of pictures and a song and that was enough to really define that world for me for references and inspiration. I’m reading Anna Karenina right now, somehow anything I come upon seems really relevant. Maybe just a word, or how a story is told, anything to lift me. DD: Are you ever afraid that your work is too intimate? Miranda July: I am concerned about that but there’s nothing I can really do. I try to push myself towards symbolism, partly for that reason but also that it is liberating. I often write a little reminder that says ‘move in symbols’ so I don’t get too autobiographical. Nonetheless, everything that I can think of that will be coming out in the next couple of years, I feel like I’m throwing myself to the lions. I really could just cry about it, that’s how upsetting it is to me, but I don’t know what to do. Oh well. Everything has its problems. DD: How about working with your partner, Mike Mills? Miranda July: I was in a music video he made but we’re always together so it seems good that we have our separate worlds. I have the movie coming up, a novel and these art things... one of which is another movie. DD: And the new movie is tentatively called Satisfaction? Miranda July: We’ll see if it holds up but I haven’t even shot it yet so I don’t want to talk too much about it. What I can tell you was when I was making Me And You I was thinking that with the next one I can’t have all these characters, there’s only so deep you can get with each one. It’s like Peanuts. So the new movie is very focused on a couple and I’m one of them. And it just goes way further. It’s way weirder.